A key component of the business strategy for any pallet recycling business is access to cheap pallet cores. 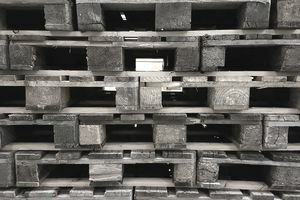 During the early decades of the pallet recycling industry in the 1970s and 1980s, surplus used wood pallets, commonly called pallet cores, were available for free or at least at a relatively low cost. As a result, pallet recycling businesses were often very profitable. Over the last two decades, however, increased competition has led to recyclers bidding competitively for large pallet core supplies, thereby squeezing profit margins. Today it is not uncommon for large generators of cores such as distribution centers, to sell their cores. Cores of the popular 48x40” size may sell in the $1.50 - $2.25 range, depending on a number of variables such as quality and the local level of demand. In a previous installment, we reviewed numerous sources of free and low-cost pallets. Some of these will not be appropriate for pallet recycling businesses, which will require substantial volumes of pallet cores to meet their sales needs. High volume sources are found at businesses where many pallets of unloaded product such as inbound ingredient or component pallets at production plants or at distribution centers where pallets are emptied as goods are shipped. Other large generation points include large retail outlets, ports, cruise ship terminals, trucking terminals, air freight forwarders, and landfills. Low volume sources of cores can also be important to larger volume recycling operations. The small quantities of pallet cores come from smaller retail outlets, restaurants, hotels, institutions, construction sites and other sources. Typically, however, recycling businesses will not retrieve these pallets themselves but will rely on pallet street vendors to accumulate these in small truckload quantities and sell them to the recycler. In aggregate, dealing with street vendors can generate much-needed pallet core volumes. When buying scrap pallets, the recycler should take steps to limit their risk of purchasing stolen pallets. To manage this exposure, many recycling companies, including pallet recyclers, record the street vendor or collector’s driver’s permit information and pay by check. Such procedures are a recommended best practice by some associations such as ISRI and a legal requirement in some jurisdictions. Also, pallet recyclers typically refuse to buy pallets with proprietary markings such as rental pool pallets. The first order of business is gaining contacts within the operation. The decision maker with respect to pallet core sales varies widely from location to location. Where in one plant it may be the general manager, it may be a shipping supervisor at another location. Many operations solicit bids from pallet companies for their cores. There has also been an increasing swing towards a national dock sweep contract for pallets at all of a company's locations. This simplifies the pallet management process for companies, removing one headache from the plate of busy site managers. However, it does hamper the flexibility of branch locations to move their business to whom they perceive to be the best service provider, locally. A national program does allow for better corporate controls. Often, the national providers offer online tracking which provides better visibility into the movement of pallet cores to recyclers. While most core generators have existing relationships in place, by becoming introduced to them, you will be more likely to be included in future bids, or perhaps offered cores on short notice if for some reason the existing core buyer cannot remove them. While the majority of pallet recycling in North America focuses on the 48x40-inch pallet, it is important to be aware of recycling opportunities for other sizes. The acquisition of pallets with boards longer than 40 inches can be disassembled and cut back to 40 inches. Additionally, by performing a free audit of pallet cores for the core generator, it may be obvious that there are accumulations of other specific sizes that hold little value, except to the initial shipper. By tracing these back to the shipper, it may be possible to arrange the refurbishment and resale of these pallets back to that business.